These beautiful Hexagon Studs are inspired by a real nut and bolt set! Yes, these earrings are cast from a real nut set so the threads on the inside are clearly visible and definitely one-of a-kind! You will adore these sweet yet minimalist silver stud earrings. Carefully polished in my jeweler tumbler, the silver is smooth and shiny! These are POST earrings, they will come with sterling silver butterfly backs. Made with 100% solid sterling silver, including the posts, these are hand-crafted earrings. 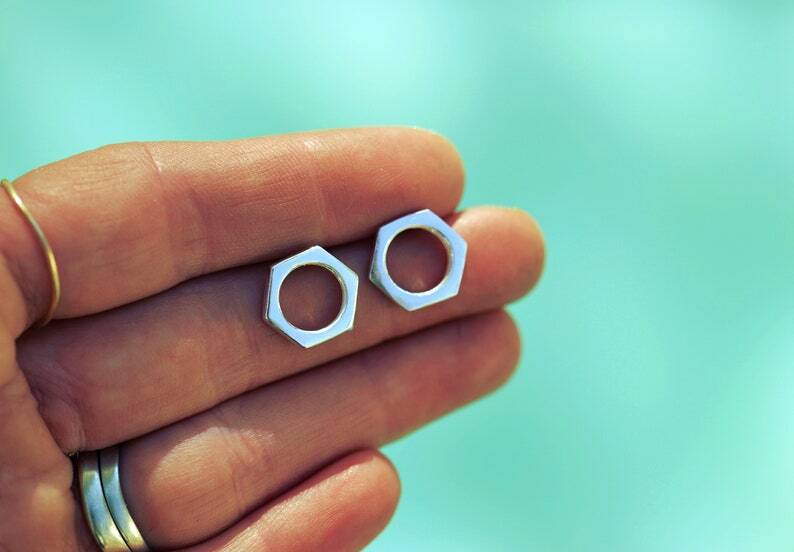 Size of the Hexagon is 1/2", they are cast from a real nut/bolt set, therefore solid sterling nut with thread marks. Your sterling silver nut and bolt earrings will come wrapped in a gift bag and tissue paper.